In 2013, nearly 3,000 of our users responded to our call for survey respondents, and we listened. We got requests for better-looking diagrams, more robust web development tools, and enhanced shape libraries, among other requests. We took action on the most pressing issues and introduced the following features! 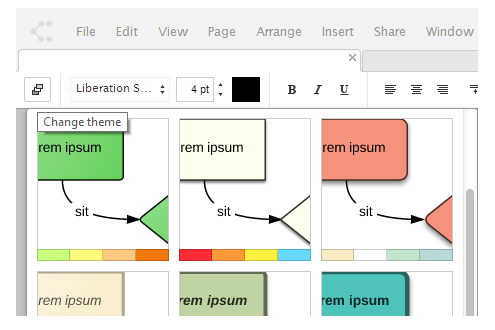 Many users have asked for a way to quickly enhance the look of their diagrams, and we’re pleased to offer a theming system that creates a polished look. Each theme applies a tasteful blend of colors, lines, outlines, and text styles to a selected diagram. To access and preview these themes, click on the preset theme button on the top left corner of the editor interface, or click on the graphics panel on the right. Try out our latest design for our org charts for greater ease of use. Users can now import data from a .csv file, assign photos to members of their organization, and otherwise expedite the creation and management of their org charts. Combine these features with the new theming system and you’ll be drawing sophisticated org charts in minutes, not days. To assign a photo, drag an image from the “User images” section or directly from your desktop, then drop it onto the org chart shape and assign to the appropriate recipient. Now the image will be connected indefinitely to that name, making it even easier to rearrange chart structure over time. To complete Lucidchart’s suite of web development tools, we now offer a complete mockup library for Android apps. It includes all the standard shapes, such as tab bars, headers, sliders, progress bars, and text boxes. Best of all, we introduced light and dark screen options, so you can demo an app experience with a complete set of style choices. We built these elements from scratch to give you less pixelation and faster loading times. Mockups are premium features, but you can demo it now at no cost! Last but not least, we’ve optimized G Suite management by implementing a search-based filter. Now you can see every user from your domain, and if someone’s not on your Lucidchart account, you can easily send them an invitation. This functionality will simplify the work of G Suite admins and increase collaboration across your organization. If you’re a G Suite admin, you can access this feature by following these step-by-step instructions -- and if Lucidchart isn’t installed on your domain, you can rectify that by clicking here.